A few weeks ago we had very special visitors. My lovely sister in law, her partner and their most adorable little girl came for a visit. I got to cuddle my sweetest niece for the first time in about 6 months. She is such a delight! She is a happy and curious little girl, and her smile would melt anyone's heart. Needless to say everyone adores her. Making things for little people is one of the ways I express how special they are to me. So I made the Bumblebee dress for my sweet niece. I made the Bumblebee dress for my daughter when the pattern was just released and have been meaning to make another one for ages! Isn't it funny how sometimes we need an excuse to finally make something? I made a size 1 dress hoping it would fit my niece by the time summer returns to Australia. By that time she will either be walking or not far from walking. In my experience dresses and crawling little girls just don't mix too well! 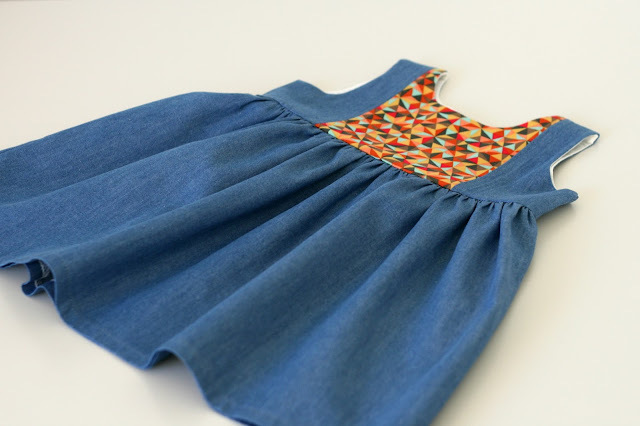 My niece's Bumblebee dress is made from lightweight denim. I had a small piece of bright geometric Lisette fabric that I have been hoarding - I mean saving - for the right project. Don't you think it looks stunning paired up with denim? The bodice of the dress is lined with lightweight cotton lawn. Small things make me happy. Like finding two buttons that match the gold/brown on the front of the dress among gazillion buttons in my stash! It might be a small detail, but it my eyes it completed the look of the dress. This dress was so much fun to make! I hope my sweet little niece will enjoy wearing it. Very, very pretty. The print and the denim just are so perfect together. What a lovely present! Waw, such a beautiful dress! Really love your combination of the printed fabric and the denim! Sweet gift, Jenya! The dress is beautiful and I am sure it will be loved by the baby girl and her parents! So sweet. 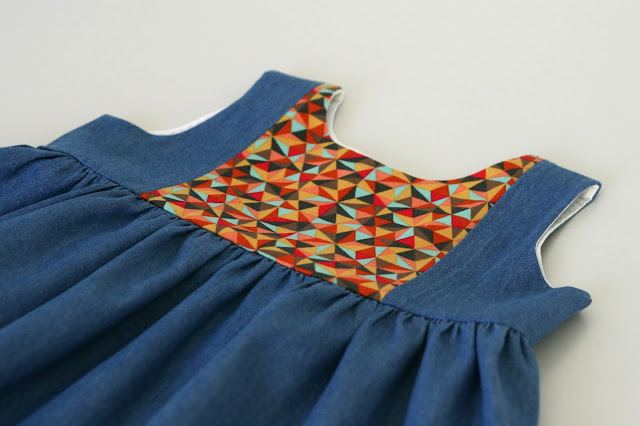 Little girls are the perfect excuse to sew! I love the Bumblebee, it is by far the pattern I used the most until now. Yours looks so cute. So cute!!! I love the fabric pairing! 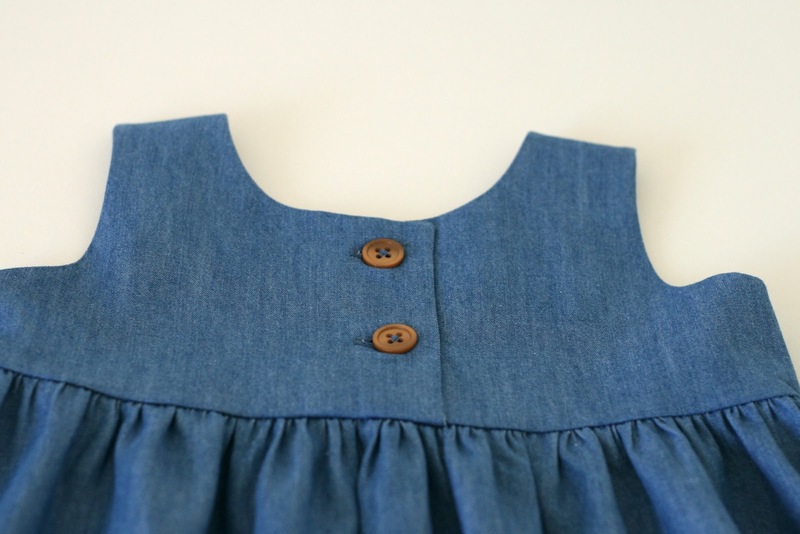 Perfect buttons...and what beautiful gathers!